Don’t have time to step away from your company to learn a new service? 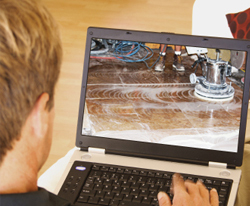 That’s why we created the first ever on-line training course teaching the detailed skills and techniques of natural stone restoration. The skills you learn from this in-depth program will help separate you from your competition and increase your bottom line profitability. Don’t put it off any longer, learn the insider techniques that will truly give you the skills to be the top in your trade. Detailed online video instruction, downloadable restoration manual, factory support, automatic CRP membership. Topics Covered: Equipment Review, Tools of the Trade, Stone Grinding, Honing, High Polishing, Filling, Scratch Repair, Wear Traffic Repair, Cleaning & Sealing, Monthly webinar training and much, much more. Topics Covered: Equipment Review, Tools of the Trade, Stone Grinding, Honing, High Polishing, Filling, Scratch Repair, Wear Traffic Repair, Cleaning & Sealing, Monthly webinar training and much, much more. Are you looking for more intense, hands-on training to get you started in the hard surfaces industry? Modern Stone offers three different courses for those individuals who want to roll up their sleeves and get dirty side by side our instructors. You receive everything that is included as part on the on-line courses, and also the industry experience that only a personal course can give. You will learn the most advanced techniques of restoration, polishing and protection available today. Every aspect of the job will be taught to prepare you for the moment you enter a real customer’s home. From bidding, site identification, preparation, restoration and finishing – you will be confident to take on most any stone, tile or grout job with the knowledge you’ll receive – and best of all, you’ll get paid for it! Take a trip to the Grand Canyon State and work personally with Jasen to learn the business of tile and grout restoration. You will work in actual customer’s homes learning the skills that will make your business profitable and successful. This two day course will cover; surface identification, cleaning methods, grout repair, color and clear sealing, and much more. It will also includes the on-line video and instructional manual. Automatic CRP membership for 1 year. Want to train your entire staff in the skills of grout and tile restoration? Can’t afford to take the time away from your business? Let us come to you and provide you with the most advanced and detailed one-on-one training available in the industry. You set the agenda, and we’ll bring the training. We’ll work with you and your staff directly on the job site to teach you the skills necessary to be successful in these profitable industries. Contact us for more information and scheduling. Automatic CRP membership for 1 year. Stop telling your customers that stone restoration is a service you can’t offer. Take the next step in growing your business and we’ll be there to help you on your journey.